Voice of a Crimson Angel is an intimate and thrilling story that leads up to your debut military science fiction book. What was the inspiration that made you want to explore a prequel? Creating VOCA was something that was on my mind for many years, but it seemed too monumental a task to handle. It wasn’t until I was in the midst of writing Ballad of Demise that I began to see a grand tale in the making. I took that single scene of Julissa Marconi from Reverence and then imagined what her life had been like up to that point and after. That was the only push for the new trilogy. Many reviewers asked questions about how the characters got to where they are, so I figured it was an opportunity to give them answers. It turned out to be a fun experience. 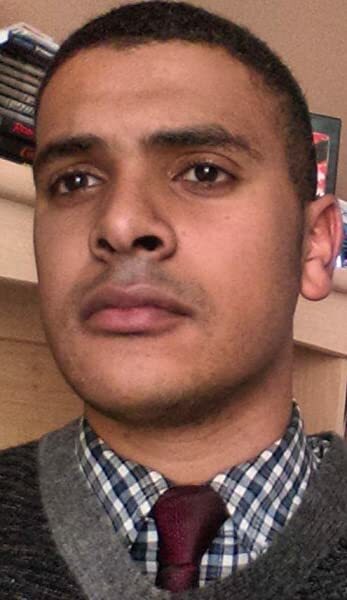 Your currently studying history at the University of Riverside. How has your major helped you write your story and develop your characters? A TON. The sad but fascinating aspect of history is that the story of the oppressed vs. an oppressor is a familiar one. From ancient Rome to the Spanish Empire, to the British and French empires, superpowers have always had their reign unimpeded for decades before eventual collapse. I wanted to build up the history of the United Nation Republic before it too faces its ultimate crisis. Whether it is still standing when the dust settles is to be determined in future installments. I also drew influence from the revolutionaries of old, people such as Che Guevara and George Washington. Once the VOCA trilogy is completed, I believe people will see the connections in a new light. History was also a valuable tool in discovering how a revolution starts. First come the words, then the fight to crush those words, and then bullets. The term ‘regime change’ is one perhaps not widely known by the average person, but it is an unquestionable factor in global history. The U.S. has often played a pivotal role in such operations, among them Guatemala, Vietnam, and Iran. The more I read, the more The Expansion seemed very possible. When writing, do you look at current events, and use them as a springboard for ideas or try to incorporate them into your story? Current events play a big role most definitely. In VOCA Part I, we see a world where warfare is basically common place. The majority of the people either ignore or don’t care about the conflicts abroad. Once again, I looked to the U.S. The U.S. has been involved in some sort of war for almost its entire history, from the Civil War, Spanish-American, the World Wars, Korea, Vietnam, Desert Storm, and now the war on terror. Vietnam was the first U.S. war to not split the American conscious on a massive scale. Since 9/11, the U.S. hasn’t slowed down its war game, now in Niger, Syria, Iraq, Afghanistan, and other countries. Despite this, there are no longer large protests confronting this reality. As we listen to music and watch the latest films, the war machine goes on expanding. These issues, primarily our war driven economy, were the focal points for me in writing the VOCA trilogy. Any chance you’ll write a prequel that shows the rise of Chancellor Venloran? Kind of like how Star Wars episodes 1-3 showed the rise of Darth Vader? In either case, what do you think that would be like? I actually have played around with this idea, and the framework is definitely there. I can imagine a young Venloran who sees his country struggling and decides to act. In a way, he’d be comparable to Joseph Halsey, which would be a great foil. It would take time to plan out, especially since I have much planned for the Reverence series. The idea is very tantalizing, though. As of now, I’ve only hinted at the rise of the UNR. For this envisioned ‘prequel-prequel’, I would go in depth to the formation of the UNR Party itself. The evilest of deeds start with the best of intentions. Julissa Marconi’s life has never been quite the same since her husband slipped into a coma. Her relationship with her daughter is hanging by a thread, she’s lost all her friends, and she’s retreated to the bottle amidst her sorrows. Truth is, Julissa is struggling to find a reason to wake up in the morning. That all changes when the mysterious Dr. Neeson offers her a chance to discover the truth, and reclaim her life. With the help of the scheming Captain Halsey, Julissa finally has a reason to fight again. She’ll have to act fast, however. Her nation, the United Nation Republic, is hungry for aggressive expansion and the ravenous Chancellor Venloran will stop at nothing to achieve his own twisted goals. 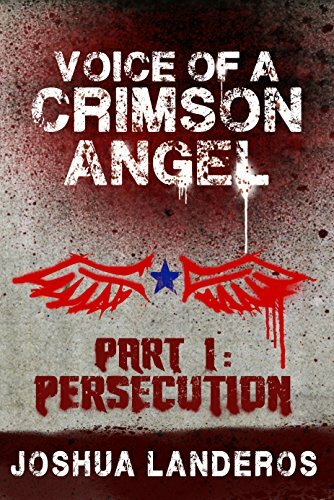 Return to the world of the Reverence series with Voice of a Crimson Angel Part I: Persecution, the long-awaited story that sets the stage for the entire saga. The fifth installment of the Reverence series, Voice of a Crimson Angel, by Joshua Landeros is both an intimate and thrilling look at the lead up to his debut military science fiction series. Julissa Marconi’s life was pulled apart after her husband went into a coma. Her relationship with her daughter is on the brink of falling apart, friends have disappeared from her life, and the only solace she finds is at the bottom of a bottle. This all changes when Dr. Neeson offers her an open door to change her life and with the help of allies like Captain Halsey, and she grabs the opportunity to fight. The ever-scheming Chancellor Venloran has his own designs afoot for the expansion of the United Nation Republic. With this new trilogy Landeros is giving background and context for his series, while also showing that the ever present villain of Venloran has been around for a long time in all of his power. If you’ve already read all the way up to Ballad of Demise, then this is another superb excuse to dive back into this torn apart world of super soldiers and war. Landeros still manages to deliver on his strengths of dialogue and action. The beginning of this novel might start slow, but it picks up that familiar fast pace I have become accustomed to from this writer. Still heavily leaning into the military science fiction legacy, Landeros uses this to full effect in the near future of the United States and pushes it further with the backstory development of characters we haven’t either met or gotten fully developed in past stories. While, the ending clearly makes room for a sequel, the novel itself is still satisfying on its own merit. It will be a treat to see where this new series goes and if there is something new waiting for us at the end, which we can hope. This stage setting series should please fans of the books and of science fiction in general with the way it keeps to the best tropes, while making fresh the well trampled ground of such narratives. Landeros keeps pushing his world deeper and expanding the horizon of both the characters and story line while managing to give readers a ride they won’t soon forget. The resistance fighters have suffered a devastating defeat at the hands of Chancellor Venloran. With many of his enemies dead or imprisoned, the Chancellor is ready to move to the final phase of his scheme: The International Summit. The historic event is just hours away, drawing leaders from all over the world to the United Nation Headquarters in New York City. Venloran believes peace through dominance is at last at hand. At the same time, Will is hell bent on launching an assault on that very night, though the remaining troops are weary and few in number. The renegade cyborg has the help of tech experts Alex and Bri, along with pilot Gabriella, but the opposition may be more than they can handle. Awaiting any threat are the Chancellor’s deadliest soldiers, among them the cyborg hunter Aliss Howard and Will’s very own former superior officer, General Kane. Looming in the back of Will’s mind is the reality that innocent people will have to die to see his vengeance finally realized. As both sides prepare to collide, none are aware that an unscrupulous politician, Secretary General Vanzetti, is eager for the bloodshed to begin. Check out the finale of the End of Knighthood Arc and prepare for a thrill ride. The Reverence Series transcends the science fiction genre and will entertain readers of horror, war, fantasy, and even the western. 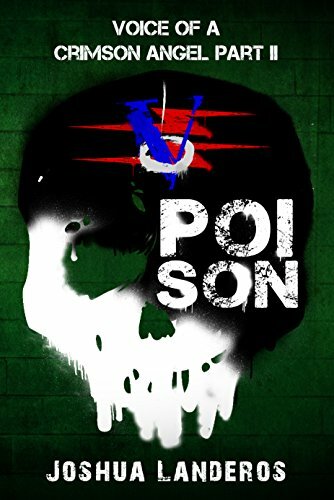 In Ballad of Demise resistance fighters have suffered a devastating defeat at the hands of Chancellor Venloran who has one more trick up his sleeve. What themes did you want to capture in this book? I tried to encapsulate many, but probably the most important for me was that desire does not equal righteousness. No matter how much Will and Venloran believe they are doing the right thing, I wanted there to always be a call back to reality. Both of them struggle to come to terms with this, as men of great power often do. This also ties into the importance of the past, namely the mistakes of history. Even though they are each other’s respective nemesis, Venloran and Will have tried to outrun their sins by doing what they see as good. The weight of their actions, however, always comes calling home. Super soldier Will Marconi continues to develop and surprise me with his depth. How have you seen this character change throughout the series? Will is so interesting for me to writer because he is caught in-between his past and new life. He’s still trying to grapple with the value of life, something he’s forsaken for a very long time. What I really enjoyed in this one was that we see that Will has some desire for normality, but he’s given up on it. In Reverence he was a cold-blooded killer and that part of him still clings to him like a leech. Fighting that urge is the new connection he’s made with Gabby, Jacob, Alex, and especially Halsey. He’s no longer isolating himself and has begun to see humans as equals. I felt that this book transcended many genres including science fiction, military and even western. Was this a conscious effort or something that happened organically? A little bit of both. In my case, it’s just me following the age-old advice of “write what you love”. From the addition of swords to a future warzone to the classic Western-style stare down, I’m just writing what I know would make me sit back as a reader and say “This is just awesome!” Initially I was worried my series wouldn’t have enough flying cars and aliens, and maybe someday I’ll write stories about those, but I firmly believe the Reverence series is a blend of my childhood fantasies and adult realizations, and I think it connects with readers because of it. With this being the last book in the End of Knighthood trilogy what story are you working on next? Will we get to see Will Marconi in any other stories? My curse is a plethora of ideas. As hinted at the end of Ballad of Demise, the next arc will be a prequel. Like the End of Knighthood books, it will be a three part series. It’s going to focus on Will’s wife and daughter and how they got entangled in this whole ordeal. Since it takes place before Reverence, readers will get to see plenty of familiar characters like Dr. Robert Neeson, Chancellor Venloran, Halsey, and Will as well. The Marconi family will be the focus, along with plenty of new characters. Beyond the prequel arc, let’s just say I have a ton in mind. There will definitely be an arc that answers a lot of the questions raised by the finale of Ballad of Demise. The King’s Move follows cyborg super soldier William, who seeks vengeance after finding the latest weapon the Chancellor holds. What was the initial idea behind this story and how did that transform as you were writing the novel? The original idea was to have a straight forward revenge plot with Will pursuing Chancellor Venloran. As I wrote on, I wanted to give the supporting cast more to do and explore their own demons. It turned out to be just what the story needed because the original draft had far too much of the action delegated to Will. Giving other characters a chance to shine was a breath of fresh air. For this entry, I had a lot of fun writing Gabriella. I feel like she’s changed a lot since the first book where she was more naïve but optimistic. She’s become very jaded, more so than her brother and to some extent even Will. She’s tried to purge herself of all mercy and I wanted to explore how it has skewed her judgement. The characters remain, along with the action, some of the best parts of the novel. What is your writing process like? My writing process is probably hardest in the beginning. I try to plan things out with a synopsis and before each chapter is written I like to have a detailed set of events in mind. The easiest, and most fun, part is putting the meat on the bones. After that comes editing, which I like to do as I go before letting a professional give it an additional look. This is the third volume in your Reverence series. Will there be another book? If so, where will it take readers and when will it be available? I have a lot of books planned for the series. The finale to the EOK arc will come in September, latest October. I’m editing it as of now and trying to get the pace just right. The next book we’ll see the Crimson Angels try to launch a counterattack on Chancellor Venloran. Unbeknownst to them, Will is wrestling with the offer given to him by Vanzetti. A ticking time bomb is how I would describe the story, and I’m confident it will be a blast for readers. The story of the Reverence series continues with End of Knighthood Part II: The King’s Move. Rebel fighters Gabby and Captain Halsey have secured the intel on the oppressive UNR government’s latest weapons. In doing so, however, they have been lured into a trap by Chancellor Venloran himself. For all the resistance movement has achieved, their fate now lies in the palm of the tyrant’s hand. Will Marconi, the cyborg super soldier who started all this, is still hungry for vengeance as well. He has been consumed with a single desire: no matter the cost, Chancellor Venloran must pay for his crimes. 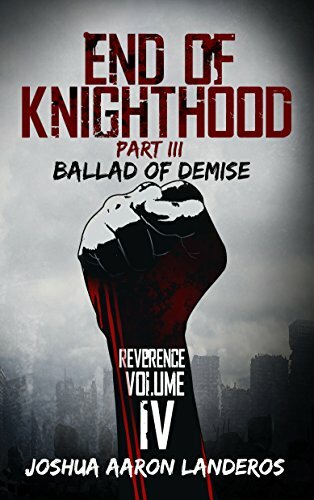 In a startling turn of events, he gets his chance to finally do so, but the cost may be too great for even him.End of Knighthood is the second arc of the popular sci-fi/thriller Reverence series, penned by debut Joshua Landeros. End of Knighthood Part II: The King’s Move keeps the action blazing forward! The second installment, by Joshua Landeros, follows rebel cyborg super soldiers and continues the story of William Marconi, who seeks vengeance from Chancellor Venloran. After finding out what latest weapon the Chancellor holds, rebel fighters Captain Halsey and Gabby, were lured into a trap and are at his mercy. This sets the stage for what the rebellion needs to do. Will, who started this rebellion, may get his chance to achieve his vengeance and end it, but the cost may be even too great for him to bear. The King’s Move wastes no time in getting back into the thick of the action and picking up where we left off in the first. The action does not break and the events become more heinous as we reach the book’s climax and the tragic conclusion. Landeros continues to borrow the best from classic military sci-fi authors with short, clipped sentences and telling “only the facts” when denoting action and danger. His world building is subtle and should please any reader who pays attention to the craft of writing. With this second part in his series Landeros has escalated the conflict and moved the stakes to an even higher plane. The characters remain, along with the action, some of the best parts of the novel. His rather wide cast of rebels and villains are all a thrill to read and fun to follow as they attempt to achieve their various goals. The book remains a blend of sci-fi/thriller that would keep any fan of those two genres satisfied. The dialogue shoots back and forth between the characters as fast as the bullets, keeping the pace quick and the readier on the edge of their seat. These are a welcome distraction from the brutal carnage that sometimes occurs. The lack of description hurts this work at times, which it makes up for since with prose that has improved since the last installment. He continues to borrow heavily from screenwriting techniques, with consistent dialogue on almost every page, while providing only deep description of the action scenes. 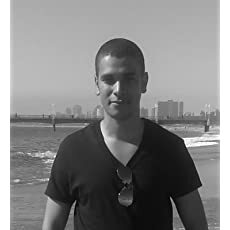 His fast pace style will suit casual readers as well as those used to thrillers and military sci-fi. The King’s Move is an exciting bridge that keeps the reader entertained and swept away on the plight of these rebel cyborgs. Anyone who enjoys a military science fiction thriller will find their palates pleased with Landeros’ work and hungry for the third installment. End of Knighthood is a ripping tale of military science fiction that follows the struggle of a cyborg super soldier as he continues to figure out his place in a futuristic war zone. What were some themes that were important for you to explore in this novel? Number one would definitely be the cost of conflict. Even though Will scored a victory for the resistance movement, it cost many lives, including those of his friends. Another important one to me was accountability for the powerful, though this takes a few different forms. Will, in one of my personal favorite scenes, simply speaks to the child one of his victim’s. Aliss Howard, on the other hand, takes vindication to the extremes. These dichotomies were essential to the story. There is a whole heaping help of action in this book. What was the funnest scene to write and why? Tough one! I want to say it’s a tie between Marisol’s counterstrike against the terrorists and Aliss Howard’s flashback to the war in Mexico. Marisol was my first chance to write an action scene for a female cyborg, so that in itself was interesting to plan out. Not to mention the layout of the city was extremely fun to mess around with. Still, I also really like the Aliss scene because one, I fell in love with the character the more I wrote about him. Despite being a family man, he has a commanding presence to even other cyborgs and a twisted sense of duty. They were both a blast. William Marconi a cyborg super soldier that is a carryover from the first book in the series. How do you see Will’s character change from book one to this book? I think his biggest change is his sense of, as previously mentioned, accountability. Before he only had to answer to his superiors, so whatever harm he laid out to people didn’t even cause him to flinch. Now he’s taking the time to analyze the extent of his actions and how it affects others. I also wanted to add more scenes of him attempting to get to know the rebels as opposed to isolating himself like when they first met. He’s doing his best to break out of his shell, even if Gabriella isn’t having it. Will there be a book 3 and where will it take readers? I’m proud to say that parts two and three of End of Knighthood are written out. I decided to break up the book to make editing easier, but the wait will be worth it! 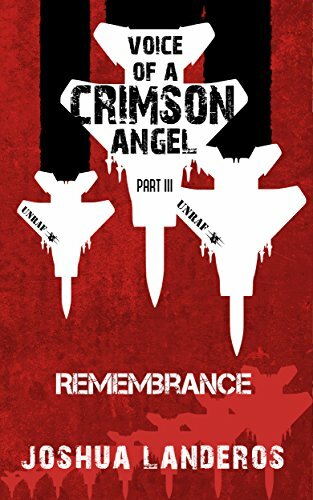 Book Three in the series (Part II) will delve into the Crimson Angel’s next big mission in UNR territory. It also will explore Will’s struggle to cope with all he’s done. It will also show us more of Chancellor Venloran’s side of the story which I think readers will enjoy. That and a whole lot more, but I wouldn’t want to spoil anything! All I can say is it’s going to be very intense. Part II should be released by late July of this year, and Part III should be out by September. I certainly don’t want to keep people waiting! Many of the major players for and against the evil United Nation Republic’s consolidation of power around the world reprise their roles in this gripping new sequel to Reverence, by standout author Joshua Landeros. After the devastating battle at the Pentagon, cyborg super soldier Will has reluctantly joined the resistance movement. Just how to fight the enemy becomes the next question. Some want to expose the government’s sins, while others crave only to execute the tyrants in power. At the same time, Chancellor Venloran is overseeing a plan to eradicate his country’s enemies for good. 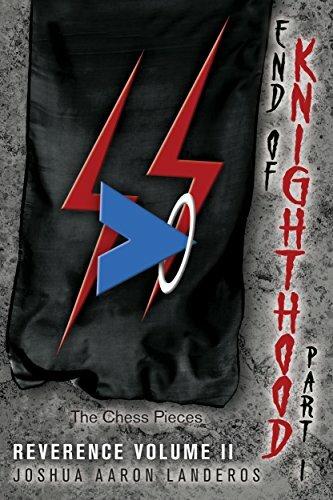 This is truly a tale of tragedy and triumph, brutality and brotherhood, as super soldiers square off for dominance and the rights of non-UNR nations to live in peace. Can the remaining countries of the world survive the determined march of Venloran’s seasoned and battle-hardened troops? Can the fresh new characters created for this superb sequel live to fight another day? And can Will, the super soldier who daily struggles with his former role, finally make up for it by helping curb the UNR’s steady growth?